To live to be 100 is a phenomenal achievement for anyone. Reaching 100 years of age signifies a fantastic life goal for both men and women. America is seeing the steady increase of centenarians as each year more and more people are living longer. A centenarian is a person who has attained the age of 100 years or more. Because current average life expectancies across the world are less than 100, the term is invariably associated with longevity. Much rarer, a supercentenarian is a person who has lived to the age of 110 or more, something only achieved by about one in a thousand centenarians. Even rarer yet is a person who has lived to 115 years old - only 1 in 100,000 centenarians make it to this age. According to the Boston University School of Medicine (BUSM), Centenarians are the fastest growing segment of our population. The second fastest is the age group 85+. Currently, there are about 40,000 centenarians in the United States, or a little more than 1 centenarian per 10,000 in the population; 85% of them are women, 15% are men. The age composition of the population is changing dramatically. More and more people are now able to achieve their individual life expectancy potentials. This is a dramatic change from the turn of the 20th century, when many people died prematurely especially in infancy and the average life expectancy was 46 years. Families on average would lose a quarter of their children to infectious diseases. When current centenarians were young children, the population, in terms of age, was in the shape of a pyramid, with the vast proportion being young and only a very few reaching very old age, according to the BUSM. With the advent of clean water supplies and other public health measures, much of this high childhood mortality disappeared resulting in an average life expectancy of 64 years by 1960. Then with marked improvements in medical prevention and intervention for diseases that befall adults, such as hypertension, diabetes, heart failure and coronary artery disease, and numerous cancers we have seen the average life expectancy climb even higher to age 78 years. Now, the shape of the population is very different. We are experiencing a rectangularization where more and more people are living beyond the vulnerable childhood years and achieving old age, so that the number of older people nearly equals the number of children. A tremendous force in the population will drive the unprecedented growth of the 65+ population -the baby boomers. The first baby boomers recently turned 50 years old. Actually, this 70 million-strong group now constitutes the "elder boomer" generation! By the first decade of the next century, there will be as many seniors as there are people under the age of 20. Approximately 3 million of these elder boomers can expect to become centenarians. An important component of the elder boomers' ability to achieve extreme age is their relatively high level of education, income and attention to good health habits. According to MSNBC.com, the average lifespan of Americans is about two or three years short of an 80th birthday party. And most people don't want to cut out coffee, soda, alcohol, cigarettes and eat healthy. Centenarians, according to Scientific American, may help researchers find the key to living longer, healthier lives. The reason, say scientists who study this elite group: centenarians may possess genes that protect them from disease into old age. For the past decade, researchers have marveled at these folks who often live independently - and free of major disabilities - well into their 90s, if not longer. Also, the odds of centenarians having a relative who lived into old age is 20 times that of the average person. By understanding the underlying biology of aging, it may be possible to develop drugs in the future that will promote healthy aging and delay age-related diseases such as some cancers, arthritis, diabetes, high blood pressure, and heart disease. According to ExUrbanPedestrian.com, the usual picture we have of centenarians is of shrivelled up old things in nursing home beds being tended by a bevy of care workers. They also have in common a simple, sensible diet along the lines of a Mediterranean diet with an emphasis on plant-based foods (fruits, vegetables, grains, beans, nuts, seeds and potatoes); olive oil as the main fat source; only natural sugars; small amounts or no animal products; and no alcohol except one or two glasses of wine per day with meals. According to the Examiner.com, many healthcare policy gurus have predicted a steep rise in healthcare expenditures as more people live to be 100 years and beyond. However, researchers who have been studying the "super-elderly" say the conclusion that costs will rise significantly for this group may be unfounded. They determined that people who reach 100 are more often than not mentally and physically "independent" - that is, they are able to perform basic tasks on their own while remaining free of serious and disabling cognitive, sensory or physical impairment. People who are currently in their 90's and are independent and able to care for themselves can expect to have the same ability when they reach 100. According to USNews.com, U.S. Census Bureau data shows there are currently more than 84,000 centenarians in the United States -- a figure that is expected to rise to 580,000 by the 2040. Among the centenarians polled, 90 percent said that staying close to family and friends was the most important factor in terms of healthy aging. Nine in 10 said keeping mentally active was critical to a long life, while 88 percent stressed the importance of having a sense of humor. More than four in five said that maintaining their independence was central to aging well, and nearly two-thirds said that lifestyle choices were the backbone of their healthful longevity -- not genetics. Technology appeared to be front and center in many centenarian lives. Nearly one in five said they use cell phones; 7 percent use e-mail; 4 percent exchange digital photos by email; 3 percent use an online dating service; and 12 percent say they surf the Web. Two percent said they specifically used the search engine Google to look for someone with whom they had lost contact.How do centenarians maintain a healthy attitude? Staying young in attitude, according to the OCRegister.com. Centenarians stay connected to news events. Centenarians engage in a wide range of physical activities to maintain their health. Talking to friends and family is the primary outlet centenarians, and centenarians are engaged in volunteer work in their communities. And, according to Spectrum Health, many among the extreme elderly are actively appropriating the cell phones, email, and Internet touchstones of far younger generations to keep abreast of personal affairs, politics, and popular culture. A significant number of centenarians practice what they preach by embracing the 21st century while maintaining 20th-century routines. 1.) Continue to acquire new skills. Develop a hobby. Learn a foreign language. Many people believe that thinking skills naturally deteriorate as you age. But research shows that people who keep learning tend to retain their mental sharpness. 2.) Be concerned about others. Volunteer, keep pets, make friends with neighbors - anything that keeps you meeting people. Researchers note these two attributes among older adults who have kept youthful attitudes: They maintain close relationships and they remain involved in the community. 3.) Exercise. You can improve your strength, flexibility, and endurance with a surprisingly small amount of effort. The benefits for your physical health will be equaled by the benefits to your mental outlook. 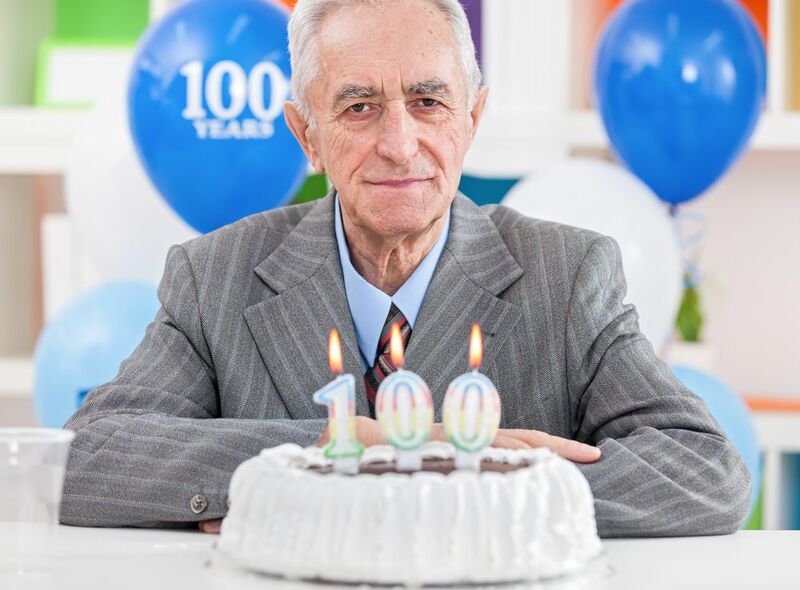 Centenarians can feel blessed and proud that they have a significant milestone they have accomplished. Hearty congratulations are in order for anyone who makes it to that life plateau.